Saturday morning dawned overcast with a brisk south westerly wind threatening more rain. Nevertheless, twenty eight ramblers (Cath, Frances, Isobel, Elaine, Jim Sime, Allan, Jack, John, Peter, Leslie, Jaqui, Steve, Audrey, Susan, Duncan, Irene, Mary Mitchell, Mary Sloan, Sue, Stewart and Julie, John McGoogan (and his dog) and his friend, Yvonne, Ken, Jim, Richard and ‘arry – one name missing!) assembled at the shore car park near Chapel Finian. Huge waves were crashing onto the stony shore sending puffs of foam scudding across the road. There was some debate as to whether it was wise to leave the cars so near the sea but, as the tide was falling, it was felt to be safe enough. 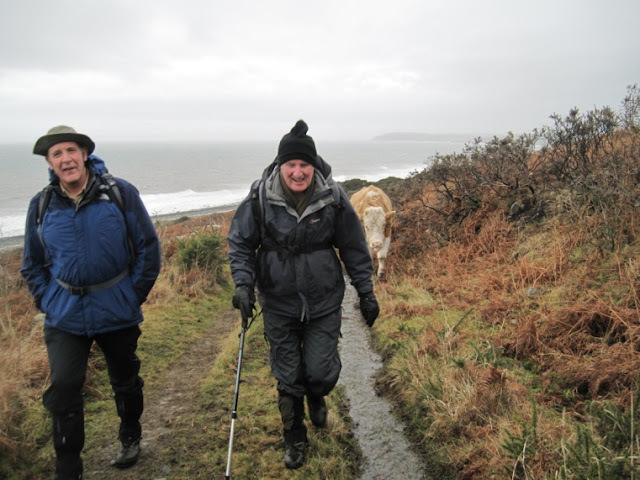 The group crossed the main road and took the old farm track which climbed the cliff behind the ruins of Chapel Finian. As the walkers set off up the track a large bull joined the group and plodded along behind them, keeping the back markers up to speed. Initially the bull gradually gained on them, to the amusement of those at the front, but it soon lost interest and fell behind to the relief of all. At the top of the hill they followed the track to Corwall Farm where they were met by four bullocks who set up a picket line across the track. Having satisfied their curiosity they stepped aside and watched the group pass from a safe distance. The group then passed the farm and set off along the concrete road towards Culshabbin. 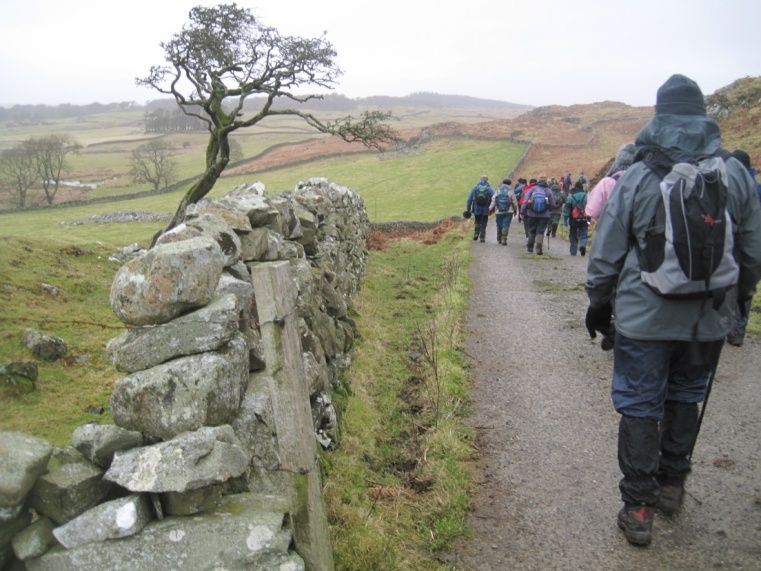 The distant hills were largely hidden by low cloud but the surrounding moorland provided plenty of variety. The rain came on in short showers blown along by the wind and most members donned a variety of additional waterproofs. On reaching the county road the group turned east and soon reached the old schoolhouse at Culshabbin. This building had previously been smart with a well maintained garden around the teacher’s house but is now sadly neglected with paint flaking off the window frames and slates sliding from the roof. The group then took the grass track over the shoulder of Gallows Hill, reputedly the site of a gibbet where criminals found guilty at the Court Cairn at the nearby May Farm were executed. 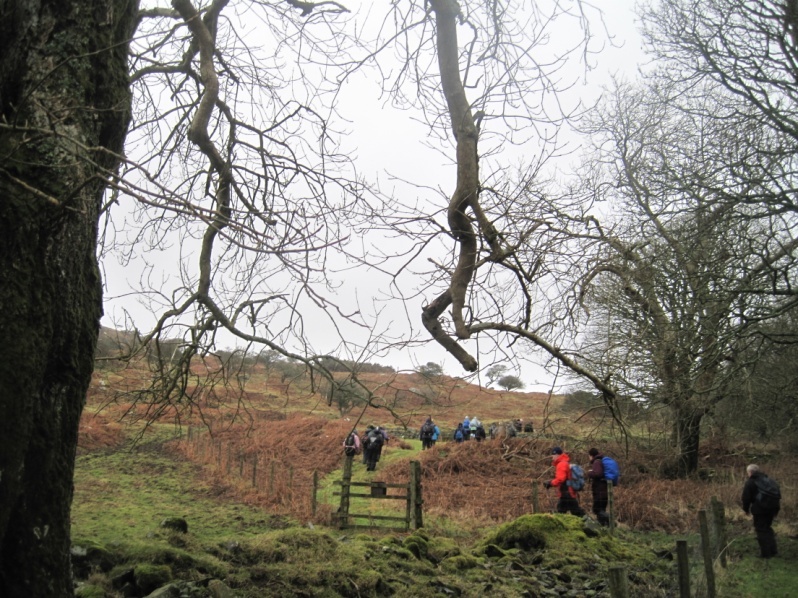 The track then led downhill around the back of the House of Elrig, onetime home of the author and conservationist Gavin Maxwell, and on to Airylick Farm. After passing through the farm yard they turned right and followed the road below the House of Elrig, crossed a rough field and soon reached the old chapel of Barhobble where they paused for lunch. 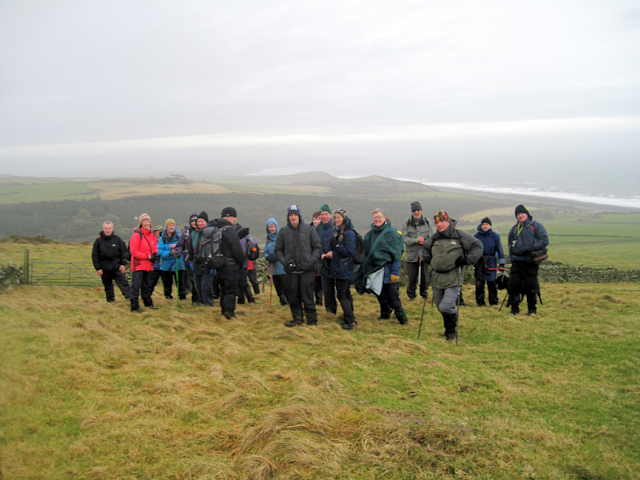 After lunch the group set off round Changue Fell. The route climbed through a young spruce wood. When they emerged into the open fields they felt the full force of the wind. The line of surf along the shore looked even more impressive as the steely grey waves crashed onto the beach far below. 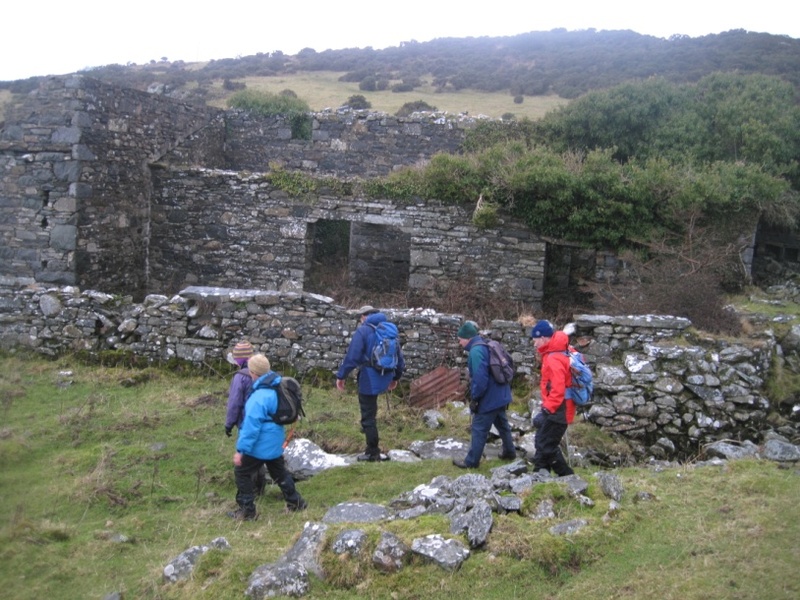 The old trackway was followed down to Changue Wood where the ramblers took a short diversion to examine the remains of an old watermill. Little remained of the mechanical parts of the mill or the water control system but it must have been a substantial operation in its day. On leaving the mill the group climbed around Bennan Hill along what was once clearly an old track leading to the mill though not marked on the maps. The weather was doing its best to cheer up with a watery sun trying to pierce the clouds. It was not very successful. The route led to the road below Chippermore Farm which was followed down to the main road along the shore. A short walk along the unusually quiet main road led them back to the cars. The timing was perfect as the rain started in earnest again as they made their departure. Many of us went on to Glenluce Golf Club for tea and cakes etc: Cath, Frances, Isobel, Irene, Elaine, Jim Sime, Duncan, Irene, Susan, Audrey, Leslie, Jacqui and Steve. We were a jolly crowd and this finished our afternoon off well.